Benjamin works on spatial data analysis and geovisualisation. His research interests include social and spatial inequalities, humanity's impact on Earth, global sustainability and new concepts for the visualisation of these issues. Benjamin was educated at the Universities of Cologne and Bonn and the Alfred Wegener Institute for Polar and Marine Research (Bremerhaven/Germany) where he conducted research on hyperspectral remote sensing applications in coastal ecosystems. After working as a research associate and departmental lecturer in human and urban geography at the Department of Geography, University of Cologne (Germany) he joined the Social and Spatial Inequalities Research Group at the University of Sheffield (UK) in 2008 where he completed his PhD in 2011 as part of the Worldmapper project with research on visualising the social dimensions of our planet. He continued working at the Department of Geography in Sheffield before joining the University of Oxford as a Senior Research Fellow in 2013. 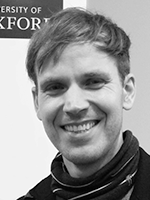 In September 2016 he joined the University of Iceland and remains an Associate in the University of Oxford's School of Geography and the Environment.